And it stuck the landing. 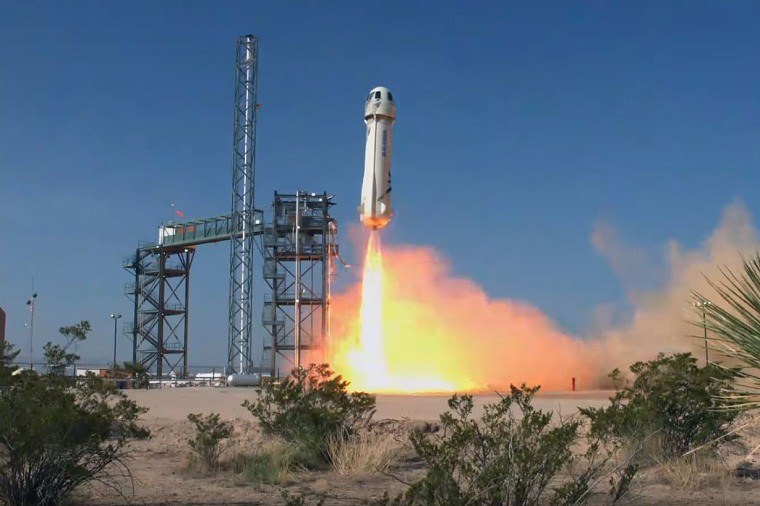 Blue Origin launched its New Shepard suborbital space vehicle for the ninth time today (July 18) during an uncrewed test that "push[ed] the rocket to its limits," as the company stated on Twitter yesterday. The launch was scheduled for 10 a.m. EDT but was delayed an hour for reasons the company did not specify. The launch also went into a brief hold eight minutes before New Shepard — a reusable rocket-capsule duo — was due to take off from a pad at Blue Origin's West Texas test site. "On Mission 9, we’re firing the crew capsule escape motor at the highest altitude ever. We are stressing the rocket to test that astronauts can get away from an anomaly at any time during flight," the company said in a statement yesterday. During the launch, Blue Origin engineers were looking for the "red line" on that system, company spokesperson Ariane Cornell said on a webcast during the run-up to the launch, comparing it to the high-stress tests that cars and airplanes undergo before being put on sale. "At Blue Origin, we're all about safety," she said. "That's where we're keeping our focus today." The test required sending the capsule up to between 390,000 and 400,000 feet (roughly 120 kilometers), then waiting for about 20 seconds for the booster to clear, ensuring that its exhaust wouldn't interfere with the capsule test. "We're going to be firing it in the vacuum of space for the first time," Cornell said. "We've never done this before." New Shepard performed as expected during today's flight, appearing to ace the test, Cornell said. Both the booster and the capsule landed safely less than 12 minutes after liftoff, the latter touching down softly on the desert floor under parachutes, sending up a plume of dust. During the test flight, the rocket was loaded up with both the Blue Origin test dummy, nicknamed "Mannequin Skywalker," who took his third flight to space today, and a host of science payloads. Those experiments touch on topics like using WiFi in space, modeling cosmic dust clouds, monitoring conditions within the capsule and protecting payloads from vibrations during the flight, according to the company's statement before the launch. The most recent New Shepard launch, which took place in April, was delayed by weather but otherwise went smoothly, with the rocket reaching almost 66 miles (107 km) and the flight lasting just over 10 minutes, according to the company's reports. The New Shepard program is designed to carry tourists as well as commercial payloads and scientific experiments on brief trips to suborbital space. According to Blue Origin's launch coverage, the next New Shepard to launch will have a fully fitted customer capsule.